Got a road show coming up? A big presentation? Eric Bergman’s unique approach will take you through a critical thinking process to strategically shape your information. 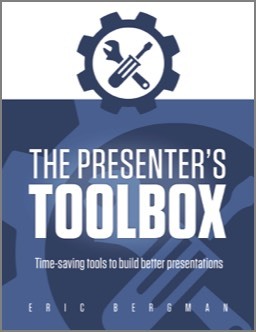 Using The Presenter’s Toolbox, a workbook that has evolved during the past 25 years of Eric’s presentation training program, Eric will help you develop content that meets the needs of your audience, while strongly supporting your business objectives. And you’ll gain a process for delivering that content in an engaging, conversational fashion that has your audience leaning in for more. Best of all, by combining content development with training, Eric not only ensures that you are fully confident to deliver your important presentation, but that you'll have a set of skills that will last throughout your career. If you need to communicate effectively when the spotlight's on—by bringing value to your audience while fully supporting your business objectives, contact Eric. It would be his pleasure to help you Present With Ease! For decades, Eric Bergman has been guiding his clients through the toughest issues, conflicts and crises any organization can face. When the going gets tough, Eric can help. He is an industry-recognized crisis communication leader. He has developed courses on crisis communication for public relations professionals, spoken at conferences on the related topics of crisis communication and transparency, and written numerous articles on the topic during the past 20-plus years. What do we do if it’s discovered that the winner of our prestigious award was caught shoplifting (which was verified) between the announcement of the award and the actual awards ceremony itself? How do we protect our brand as we manage this long-term environmental cleanup? How do we tell people that chemicals from our site have migrated off site, and are now affecting their neighbourhoods? How do we protect our organization when one of our employees—who was referred to us by a federal government agency—has been arrested and charged with international crimes? Should we and, if so, how do we answer questions from journalists outside the courthouse? How do we deal with the fact that one of our employees lost a laptop on which dozens of private patient records are kept? How do we transparently protect our brand after one of our employees breached hundreds of private records? Contact Eric to learn how his issues management experience and advice can protect your organization and its brand during times of crisis.